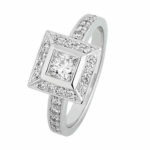 The princess cut diamond is a square shape with sharp and uncut corners, renowned for its all-out brilliance. 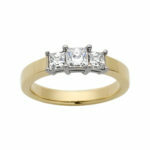 After the round brilliant cut, it is the second most popular cut on the market. 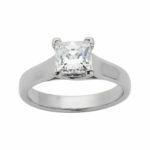 The faceting is very similar to the round brilliant cut. 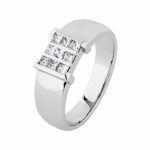 By and large, these diamonds have 76 facets, giving it more brightness and intensity than the round brilliant. 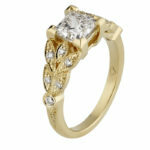 They have a very contemporary look about them, making them popular with modern women. 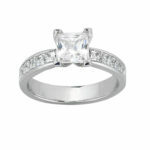 Raffini Jewellers are highly experienced at custom-made engagement rings, including princess cut engagement rings. 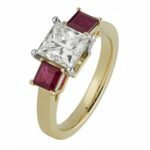 The gallery below showcases our unique engagement rings, hence any aspect of the ring designs you see below may be changed to suit your preference, from diamond shape to metal choice. 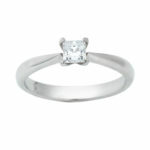 We also sell loose diamonds at very competitive prices. With our workshop and studio in one Sydney CBD location, we have very low overheads and can pass the savings directly to you. We can custom make any princess cut diamond ring to suit your budget. 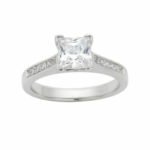 As with all of our diamonds, our princess cut options are all conflict free, as certified through the Kimberly Process. 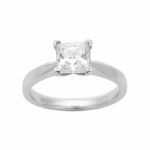 It is very important for us that our diamonds are ethical, both because it’s important to us personally and that is what our clients wish. You can find out more about this process on our information page. We cater for all your needs and requirements when creating the square engagement ring you envision. 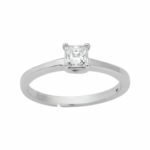 During a free consultation we will demonstrate the 4Cs, shape and fluorescence of a wide range of diamonds to assist you to deepen your knowledge and understanding of their characteristics. 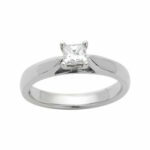 We offer a range of loose diamonds for you to choose from and can discuss with you the characteristics of the diamonds you are interested in for very competitive prices.